You already know the sleep-deprived/frazzled/busy feeling of trying to cook nutritious meals with a newborn or toddler in tow. Well, we’re here with a challenge that may actually make your life a little easier. Are you game? Then join us in our PARENTS NEED TO EAT TOO COOKING PARTY! 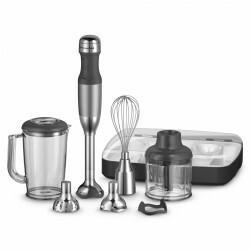 You could win prizes from HarperCollins and KitchenAid. 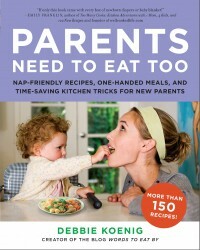 PARENTS NEED TO EAT TOO is the first cookbook from popular food blogger Debbie Koenig, whose blog PARENTS NEED TO EAT TOO (formerly Words to Eat By) has helped thousands of moms with her funny yet comforting voice and her delicious moms’-lifestyle-friendly recipes. To usher in the publication, which goes on sale February 21, 2012, HarperCollins and KitchenAid are sponsoring a party—where the guests are fantastic family bloggers, and the good times are had in the kitchen! As a participating blogger, you’ll be asked to cook recipes featured in PARENTS NEED TO EAT TOO. There are two levels of participation: blog at least once in the three-week period and you’re entered to win one of 10 KitchenAid 5-Speed Hand Blenders; OR blog three times (once a week for three weeks) and you’re entered to win a KitchenAid 13-Cup Food Processor. All participants will receive a free copy of PARENTS NEED TO EAT TOO for giving away and a library of three WIlliam Morrow Cookbooks. We’ll also support you with assistance with building blog traffic and your social media platform with the help of Parents Need to Eat Too blog, KitchenAid, and HarperCollins. In order to be entered to participate in the PARENTS NEED TO EAT TOO COOKING PARTY, read the criteria below and then complete the form. During the 3 week period, February 1-21, 2012, participants must post to their blog about their experiences cooking from PARENTS NEED TO EAT TOO. They may prepare any dish from the book that they wish, but we ask that they do not post the recipes unless it is one of the pre-approved recipes (a list will be provided with the digital assets). Bloggers will write 1-3 posts about cooking from PARENTS NEED TO EAT TOO. We of course welcome more frequent posts if so inclined! Participants will help to spread the word about PARENTS NEED TO EAT TOO through their Facebook page and Twitter feed. Participants are encouraged to engage in dialogue with other bloggers who are participating in the Blogger Party by commenting on their blog posts, RTing their tweets, and liking and commenting on their related Facebook status updates. The deadline to apply is January 26, 2012. Participants will receive materials by January 31, 2012. Promotional support provided by KitchenAid. Visit them on Facebook, follow on Twitter, or join them on Google+. I’m pretty sure this makes me a total weirdo, but that handblender is so pretty. What a great promo…cannot wait for the big release! Ha, thanks Julie! It’s pretty darn sweet, that’s for sure. WAY fancier than your average stick blender. The processor is so cool I can barely control myself–I’ve got one & I’m going to blog about that separately soon. joined. can’t wait to spread the word!